Wyatt is a heart-stealing senior love bug that was found wandering around outside of a Wal-Mart in South Carolina in July. He loves being near his human and sleeping in the bed. Tummy rubs are also a favorite. Wyatt is very mellow and easy to handle. He also tolerates baths well. Wyatt's age is estimated at 12. He is the PERFECT companion for a senior citizen! Wyatt's vision is somewhat compromised due to untreated dry eye and he requires daily eye drops. 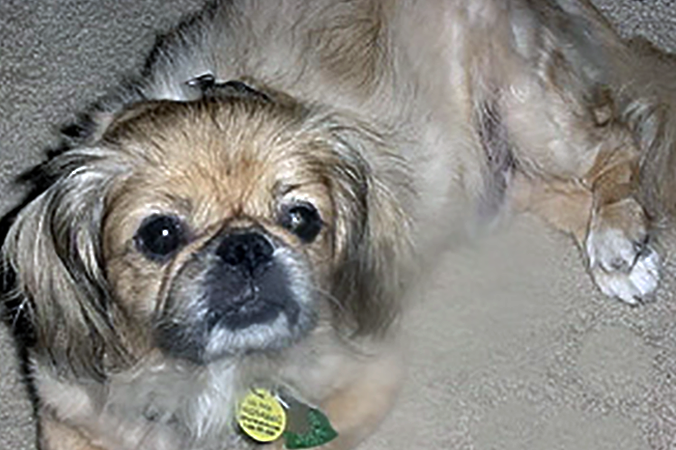 He gets along with his "brother and sister", also Pekingese, in his foster home. As with any Pekingese, wouldn't recommend him to households with small children. Wyatt is a little chowhound. Loves his food. ☺ Can be a little food aggressive so caution needs to be followed if feeding with other animals. He walks on a leash but doesn't seem to have a lot of experience doing so. He is a warm and loving little guy and needs a home where he is loved. Wyatt is being fostered in Myrtle Beach, SC and his asking adoption fee is $100. NOTE: We have listed the town and state where each dog is being fostered. Please consider how far you are willing to travel when filling out the application. The foster home will usually volunteer to help with transport for a reasonable distance.